With my cruise to Cuba 🇨🇺 behind me it is now time to add one more country to my list of visited countries, and possibly it will be the last addition for a while, Bermuda 🇧🇲. It’s a short cruise, only 5 nights, but I’m doing back to back this time round, with 9 nights to New England and Canada 🇨🇦 (where I’m hoping to get some relief from the relentless tropical 🌴 Caribbean sun). The sailaway from Baltimore was a long one, but with a sunset at around 20:30, it meant we could enjoy the views around the Chesapeake Bay for quite some time. It was near sunset when I was sitting in the Centrum, watching the cruise director staff and guests participate in games, I glanced over at the windows to see many guests gathering to enjoy the final solar performance for the day. And what a spectacular sunset 🌅 it was. The Grandeur of the Seas may be old, but like the other Vision class and Radiance class ships 🛳 you can really take in the views from many places from within the ship. You know you are at sea. Another benefit of these smaller ships, within the first few hours of the cruise, I had found 4 staff whom I had met from different ships on previous cruises. And for me that is a true highlight. I was on the Harmony for 3 weeks when I finally ran into one of my favourite bar lasses from my time on the Explorer. I had no idea she was onboard, and I didn’t see here again. The more I cruise, i increasingly find myself attracted to the smaller ships. And it concerns me that Royal Caribbean haven’t announced anything to replace Vision or Radiance class vessels. (My Majesty of the Seas post is written, I just need to proof read it some more and make those final touches before I can get it posted). Bigger and better? Or Practical and Soulless? 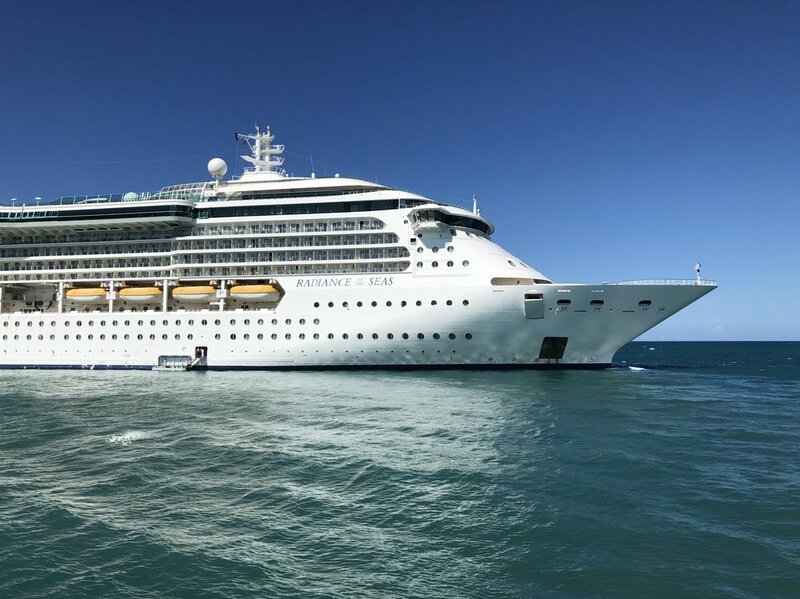 My friend sent this article from Bloomberg to me, highlighting the changes in the cruise industry in its efforts to modernise and attract a younger market. Gone are the days when entertainment at sea consisted of a lounge act near the mini casino and shuffleboard on the lido deck. As Norwegian Cruise Line Holdings Ltd., Carnival Corp. and Royal Caribbean Cruises Ltd. build ever larger vessels and try to lure younger guests, they’re unleashing an arms race to deliver ever more-elaborate onboard activities. In addition we see cruise lines moving away from all inclusive packages, and start charging for various activities and dining. Royal Caribbean has a few specialty restaurants requiring payment (and I can't help but feel that Harmony of the Seas has been designed to really push guests to specialty dining, the Windjammer buffet is one of the most limited I have encountered). They are also charging guests on some cruises to use features like the North Star. As one of the officers confessed to me the other day, one of the problems with the larger ships is "throughput". How can RCI give all guests a chance to experience all the features onboard. Norwegian has addressed this by introducing fees. The North Star viewing platform over Auckland Harbour. On some cruises it costs money. To long time cruisers this feels like (to borrow the American phrase) "nickel and diming". But how else do you provide everyone a chance to use the facilities? One option could be coupons; Royal Caribbean's Seapass already comes pre-loaded with the "coupons" for food and drink available to that guest, there is no reason it couldn't be extended to the activities and shows on board. But of course coupons don't increase revenue, and at heart every cruise line is a business with shareholders, revenue is what they do this for. My concern is that in search of the "wow" Royal Caribbean (and the other cruise lines) are losing the romance. Go-Karts and Laser Tag, how often do you want to do that? How often can you go down the same water slide? How many times can you ride the Flow Rider before you are asked to get off to allow other guests a chance? How many times can you escape the same Escape Room? Not only is throughput limited, the law of diminishing returns begins to apply. Then ships with the "Wow" become ships with the "been there! done that!" And the arms race of developing attractions and excitement just gets taken to the next level. All at the cost of what was at the core of cruising, personal relationships. The smaller ships, limited by physical capacity, rely on the emotional experience to generate great memories. The physical rush of laser tag, go karts, or big water slides is so temporary. But emotional connections are longer lasting, richer and more meaningful. The romance and character of smaller ships is getting lost in this new age. I wonder if there will be space in the future for a cruise line dedicated to some of the old experiences of cruising, with less emphasis on the superficial and more on the heart and soul. I can only hope, but I am not holding my breath. Doesn't matter what ship you are on, sunset at sea is awesome. Any reader of my blog will know that the Oasis of the Seas was the ship that inspired me to cruise with Royal Caribbean. When it was launched in 2009 I was completely taken by the sheer size of the ship. The number of guests, the gross tonnage, the activities, and the facilities were all incredibly amazing. Jump forward nine years, and five cruises on board three Oasis class ships (Oasis, Allure, and, Harmony), I can safely say that I am done with this class of ship. Everybody is entitled to their opinion, and there are many people who love these ships, I just happen to be one that doesn't. The ships are just too big, they are impersonal, lack intimacy, character and charm. All the activities require reservations, and if you're late, too bad, so sad bye-bye, you aren't getting in. With the exceptions of Ocean view, and Ocean balcony rooms, the deck five running track, and decks 15 through to 17, you would never know you are on a ship. And one of the reasons I like to cruise, love to cruise it Is to be on a ship. I love sitting in the Schooner Bar watching the ocean as I have a whisky, or play trivia or both. I love getting to know the crew and my fellow passengers, I love walking up to the evenings entertainment and finding a seat, I love sitting out on the helipad with a cup of coffee watching the stars at night. Wooden shutters on the Enchantment of the Seas, so much more charm than the grills used on Oasis class. Sitting in the Schooner Bar on an Oasis class ship, is like being in a bar, next to a food court, in a shopping mall. With activities occurring there often interrupted by the events happening on the Promenade, and for the more popular activities seating can be very limited. The lido deck, is a mass of melanoma seeking, speedo wearing hordes. The Promenade Deck is the smallest shopping mall in the world, with all the commercialised hum, and none of the benefits. The outdoor movie theatre is for those who like watching things from an alternative angle, you sit in a seat with your body facing one direction and your head turned slightly a different direction. Who designed this mess? The Oasis class is a ship for people who actually don't like cruising, they don't like the movement of the sea, they just want to drink, be entertained, and see some new places. It's a big floating hotel, it's an amazing feat of engineering, the logistics of feeding, and supplying the ship mind-blowing, but it's just not for me. Personally I'd love to see them sunk and turned into artificial reefs and wreck dives, they would be the most amazing wreck dives in the world. 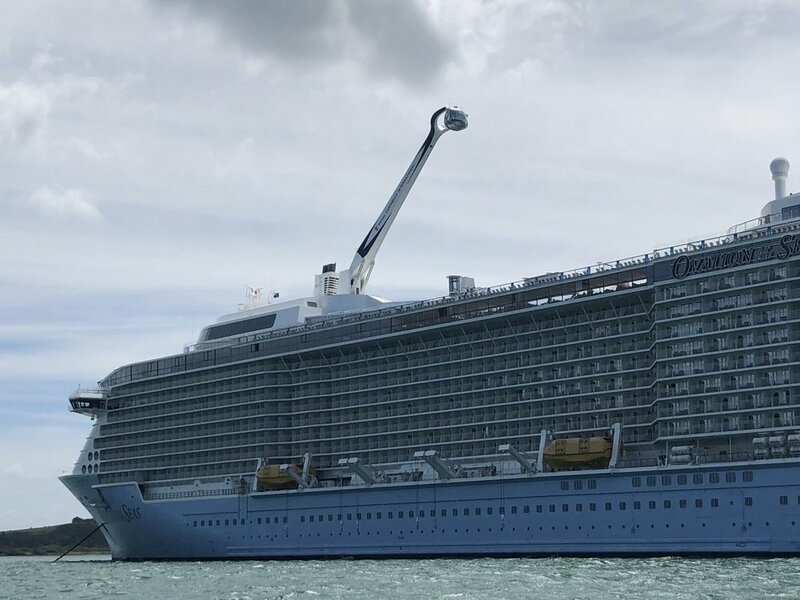 Currently Royal Caribbean have no plans to build smaller ships, nothing has been announced to replace Vision or Radiance class, and they are definitely two of Royal Caribbean's best sized ships. Vision Mk2 or Radiance Mk 2, that would be some exciting news. I have 1 more cruise on Harmony, then 2 on Oasis at the end of July, and that's the end of Oasis class for me. I will make exceptions, somebody buys me a ticket, I win a cruise, or an amazing itinerary, so never say never, but still no more future Oasis class bookings for me.